The Chinese Ambassador to Nigeria, Dr. Zhou Pingjian has expressed the intention to enrol into the University of Calabar (Unical) Institute of African and Asian Studies as student. 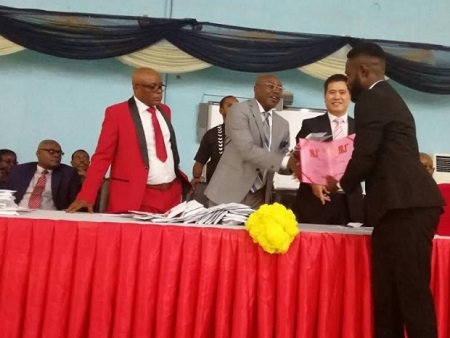 Pingjian disclosed this on Thursday at the University International Conference Centre while presenting scholarship valued at N100,000 to 47 students of the institution. Explaining that the scholarship programme will be an annual event, he noted that being part of the university will give him opportunity to share with students and staff China's success story while learning more about Africa. The Ambassador further said that the event was to commemorate the 47 years of Nigeria-China diplomatic relation. On the choice of Unical, he said that it was chosen because of it visibility and honest leadership adding that it is the leading second generation university in Nigeria. According to him,"The Vice Chancellor want this programme to be annually but as a Chinese Ambassador I want to give him and the management team one condition; I want to send application to be a member of the Institute of African and Asian studies of the university. "We have very good reasons to be here annually. From when this university started in the 70s, from the records I've, it was founded with only about 800 students but today the number has grown to over 40,000. This is just one of the many achievements of this institution. "The Vice Chancellor knows so much about China and so we choose Unical to mark the 47 years Nigeria-China relation because of the honesty of the leadership and its visibility. Unical is a leading second generation University in Nigeria so I'm impressed with the achievements so far". He expressed his country's commitment to take their relationship with Nigeria and other African countries to a higher level saying that China has many similarities with Nigeria. "We wish to take China-Nigeria relation to a higher level. This year marks China 40 years of reforms and openness. We have reached the level we are today because of three things; Strong Leadership, Policies and hardwork. "Nigeria is much better in natural resources than China but Nigeria's population is about one third of China's population so the fear of the pressure to feed ourselves make us work very hard. If we have other alternative, we will adopt it but since we don't we have identified the three factors which are very serious ingredients to our success. "There are many similarities between my country and Nigeria. We became an independent country in 1st October just like Nigeria. We are the largest country in Asian while you're the largest in Africa. So we share many things in common", he said. Earlier, the Vice Chancellor, Prof. Zana Akpagu thanked the Chinese Ambassador for choosing Unical for the event adding that the university will partner with the Chinese embassy for exchange programmes. Prof. Akpagu said that "I want to appreciate His Excellency for choosing Unical. We're very grateful that our university has been chosen as the number one by the Chinese embassy, this shows that our profile is rising and we will continue to work hard to be ranked the best in the country. "We have just instituted African and Asian Studies and we have been looking to meeting with you to see how we can partner. Thank God you're here today. We're thinking of you helping us to get lecturers from there so that we can learn your languages, our Engineering faculty will learn from your science and technology. We will also be sending our students and lecturers to China to learn modern technology". Speaking, one of the awardees, Christabelle Mbeh, a 300 level law student said that " I feel very elated. Obviously, this is God's grace singling me out of many people better than I am for a miracle. I really want to say, diligence pays. Hard work pays. And nothing can ever stop God's favour in the life of a person. "I thank the Chinese Ambassador and our amiable VC for this great honour. This will spur me and others to be more focused".